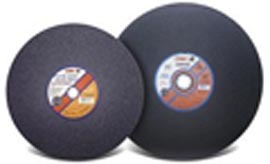 CGW Camel Chop Saw Blades, Type 1 A36P, are constructed of Aluminum Oxide with a medium size grain and grade. The heavy duty double fiberglass reinforced 3/32" thick blades are 14" in diameter and have a 1" arbor. Applications: general purpose, metal and steel. For portable chop saws.